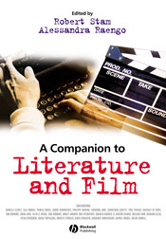 A Companion to Literature in Film provides state-of-the-art research on world literature, film, and the complex theoretical relationship between them. Essays by international experts cover the most important topics in the study of literature and film adaptations. Covers a wide variety of topics, including cultural, thematic, theoretical, and genre issues. Discusses film adaptations from the birth of cinema to the present day. Explores a diverse range of titles and genres, including film noir, biblical epics, and Italian and Chinese cinema.